Just saw these on Twitter so I thought you might be interested in them. 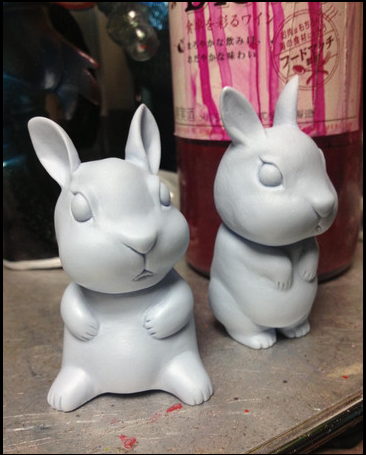 Lulubell Toy Bodega is offering up these blank Siccaluna bunnies as an open run preorder. So if you want to order 500 of them you totally could, but you only have a week to do so and they're $8 each, so maybe shoot for 400 of them. Don't wanna not be able to eat dinner. Anyone who enjoys customizing toys should be all over these. They're cheaper than Dunnys! They're also offering up this Devilman figure made by Siccaluna Koubou and painted up by Grody Shogun. These are much more limited and they are available for preorder while supplies last. And by supplies I mean the ones that are in a giant shipping crate making their way to Arizona as we speak. $80 will guarantee you one.